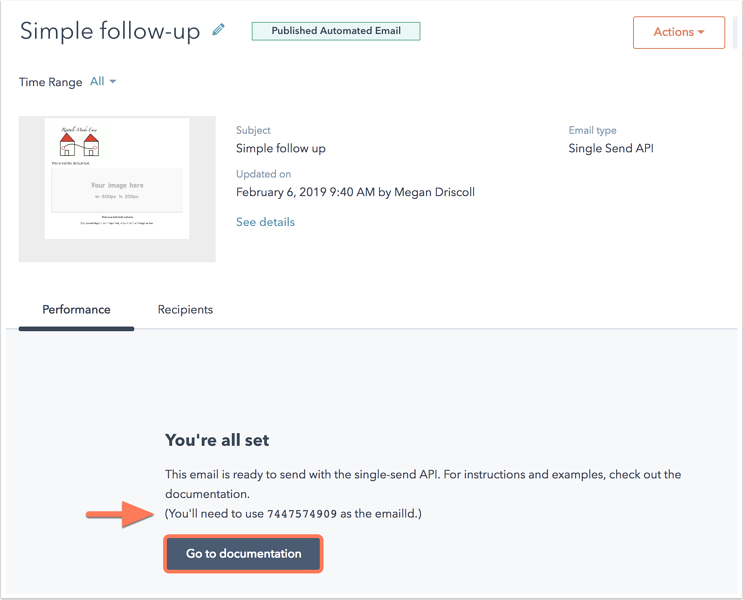 With the transactional email add-on, you can use the single-send API to merge custom properties. Use this endpoint to render the email, add some customizations, and send the email to the intended recipient. In the main email body, insert the desired personalization tokens. To use a custom property that doesn't exist yet, click the source code icon code and add the token in the code of your email. Click the Settings tab and use the Email type dropdown menu to select Transactional. Click the Recipients tab and select Save for single-send API. Click the Review tab, then click Save for single-send API. In the dialog box, click Save email for single-send API. Once saved, you'll get an internal email ID to use with the API in the email Performance tab. Copy the internal email ID, then click Go to documentation to push values to the personalization tokens in your email. Please note: you can find the internal email ID at any time in the email details. In your HubSpot account, navigate to Marketing > Email. Click the name of the email, then click More details to see the Internal email ID in the slide-in panel.